Uncovering Food: July Mystery Challenge Awards! Here's my attempt to meet the challenge. I have no idea how to make it look pretty but gee golly it was tasty. It is just eggs scrambled with milk and cook with chopped roma tomatoes. Top the scramble with blue cheese and toss it in a tortilla! That said... I was clearly outdone by some FABULOUS reader entries! Check out this deliciousness. Click on the picture and it will take you to their blog entries. YUM! 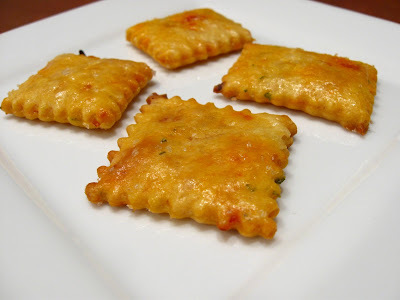 Tara over at Cooking from Scratch wins top honors with her Gorgonzola and Sun Dried Tomato Crackers. This actually sound like they are pretty easy to make, and they look awfully tasty! 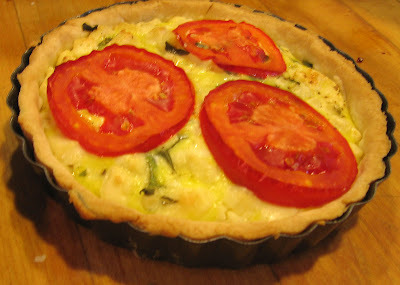 While she claims to have missed the deadline, I still wanted to recognize Melody over at Trap Door and send her an Honorable Mention prize because her Tomato Tart is drool worthy! those crackers are genious use of the ingredients!! sound tasty too! I love the sound of those crackers! All dishes look delicious here! Those crackers look wonderful! I can't believe they didn't come from some gourmet store. I put you in my reader so now I wont miss a thing - I cant wait to hear about the august challenge because these july entries look great!